Simply pull up the retractable banner and lock it into place, and you have a large and colorful way to reach potential clientele. 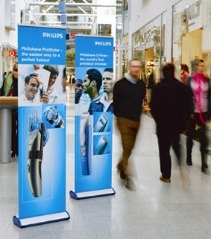 Pop-up banner stands are lightweight and easy to move, which makes it a breeze to set up or relocate your banner to wherever it is needed. Our reprographic experts provide printing services for your banner to ensure that you get exactly what images and words you want on your display. Having a customized pop up banner display made won't create a huge drain on your bank account, making it one of the most affordable ways to add a bit of color to your storefront. Contact Jason in our Reprographic department for more details!